The A35 is the first hot hatch from Mercedes-AMG and its most affordable car to date. Both are significant milestones as the fast car arm of Mercedes seeks to broaden its appeal and customer base. To do this, AMG has toned down the power compared to the previous A45 and this new A35 comes with 306hp from a 2.0-litre turbocharged petrol engine. No surprises there as this is the default motor for so many hot hatches now. 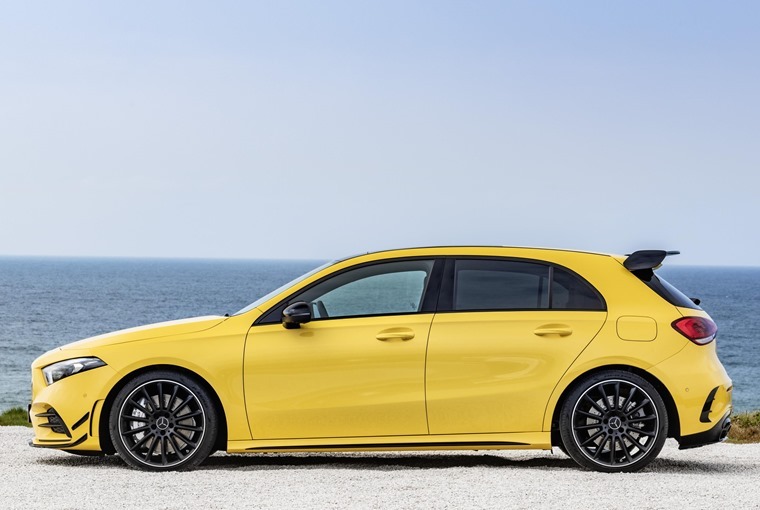 Mercedes does buck the trend to a small extent by fitting all-wheel drive as standard to its car, which elevates it above the likes of the Honda Civic Type R and Renaultsport Megane. As a result, the A35’s natural rivals are the Volkswagen Golf R and Audi S3. This is also true of the A35’s pricing, which pitches it a good notch above the Honda and its ilk and starts at £35,580. 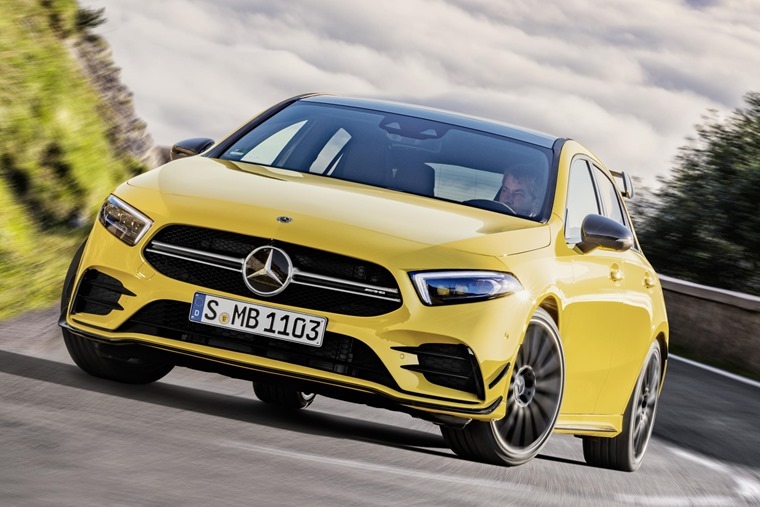 Of course, leasing will make the AMG a more attractive proposition, but you will need to factor in some extra spend to make the A35 the car you really want to drive. You’ll probably also want the superb 10.25-inch colour display that is part of the AMG Executive pack. From our experience of the car, you need the Adaptive Damping option at £695 to give finer control of how the car rides and behaves on bumpy roads and in corners. You’ll probably also want the superb 10.25-inch colour display that is part of the AMG Executive pack that costs £1395 and also comes with heated seats, parking assist and leather upholstery. To top off A35, the Style package comes in at £2595 for all of the glossy black exterior bits like the rear wing, diffuser, front splitter and 19-inch alloy wheels. All of that lot brings to total of a well specced A35 to around £40,000 and will bump up the lease price accordingly. However, it’s no different to how much you’d spend on a Golf R or S3 with some choice extras, so the Mercedes is decent value within this exclusive sector. And that kind of money is not so much to pay for a car that can hit 62mph from rest in 4.7 seconds and head on to a capped top speed of 155mph. All that and it can still offer 38.7mpg combined economy and 167g/km CO2 emissions, so an A35 need not break the bank in running costs. The A35 is more than up to the task of dealing with the UK’s battle-scarred tarmac. You won’t be thinking about fuel efficiency, though, when making the most of the A35’s considerable talents on a winding A-road that’s its natural habitat. During our time with the car on some of Scotland’s most challenging routes, the A35 showed it’s more than up to the task of dealing with the UK’s battle-scarred tarmac. Even larger tears in the surface didn’t upset its composure and balance on the optional 19-inch wheels, though these rims do kick up a little more road noise than we’d like when cruising on the motorway. A finely judged ride is a much underrated skill for a hot hatch. While you may think a firm ride equates to sporting prowess, the truth is a car that can flow with the road is one that has wheels in contact with the surface to deliver grip and traction for cornering, braking and steering. All of this the A35 does not just competently but with considerable aplomb. The steering is a particular highlight of the A35. Where the previous A45 was all about dragster speed and huge levels of grip but with almost not feedback or interaction with the driver, the A35 trades off some of that ultimate speed for a far more engaging experience. It’s one we’re much more impressed by as this AMG works with you to make the trip memorable. The steering is a particular highlight of the A35 and puts it right into contention with its direct rivals as the car to choose in this sector. There’s lots of information sent back to your hands on the wheel but no fidgety messages or kickback. It lets you place the AMG with precision and make the most of the high level of hold the tyres have on the road. Using the Ride Control and Adaptive Damping to hone the car’s reactions, rapid progress is easily possible. It’s made all the more simple thanks to the punch from the engine. It’s not the most tuneful or character-brimmed motor, especially when thought about in the context of AMG’s V8 bruisers, but it’s very business-like when pressing on. There’s no delay from the turbocharger and masses of mid-rev stomp, as well as plenty of power remaining in the higher reaches of the rev band. The seven-speed twin-clutch gearbox fires through its ratios with no discernible interruption and the steering wheel paddles offer the driver more control when desired. Switch the A35 into Sport or Sport+ modes and you also get a smile-widening bark from the exhaust on the over-run or as you change down a gear. Switch the A35 into Sport or Sport+ modes and you also get a smile-widening bark from the exhaust. So, this AMG has all of the important hot hatch driving boxes ticked and it’s the same story in the cabin. The seats are supportive and padded in all the right places for day-long comfort, while space is generous enough for four adults and luggage to ferry from one place to the other without aches. 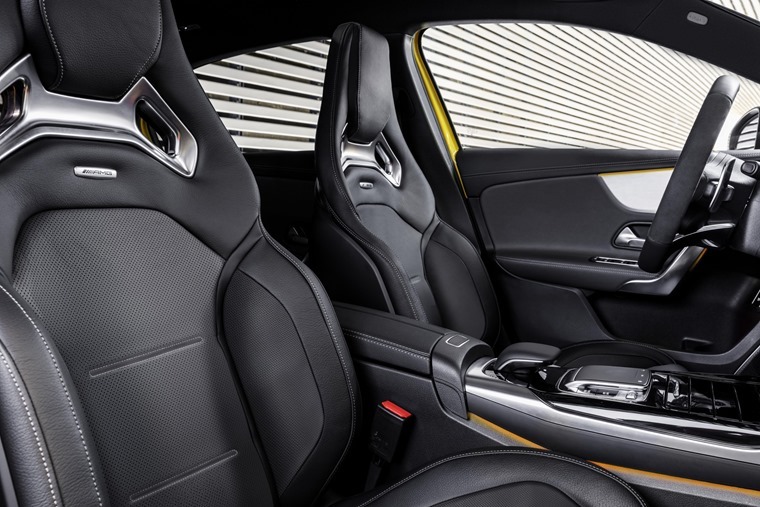 The front passengers are treated to sports seats that are the same as the AMG Line ones in other A-Class models rather than the Performance seats that Continental buyers get. We’re more than happy with this as the ones in UK-supplied A35s are more comfortable. There’s also Mercedes excellent MBUX infotainment system that a doddle to use and responds quickly to commands. All of this adds up to a hot hatch that has the capability to be deeply satisfying over the long term. While some, like the now-defunct Ford Focus RS, delivered in-yer-face thrills from the word go, the Mercedes-AMG A35 is a slower burn of a hot hatch. We reckon it’s one that will impress more the longer you have it, and it already starts off very well. 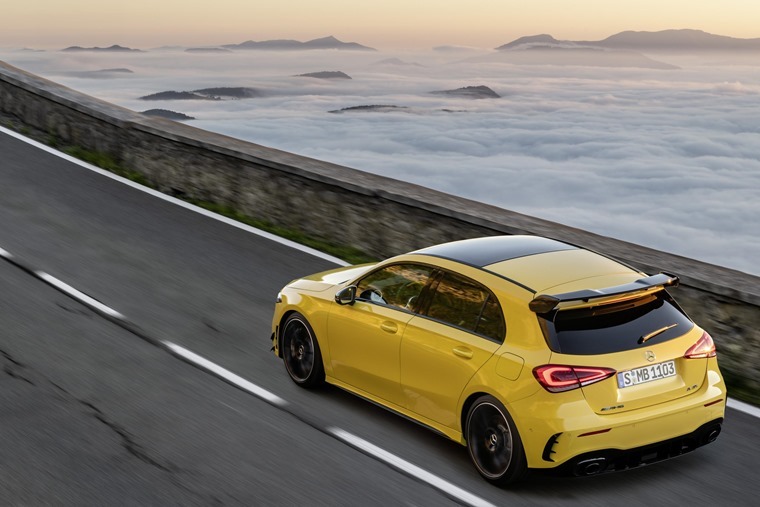 It means AMG has hit its mark brilliantly of creating a hot hatch with wider appeal than some of its other more expensive models. This is a car that can pull off a covert grey or bright yellow in equal measures. The bladed diffusers and rear wing mark it out from lesser A-Classes. 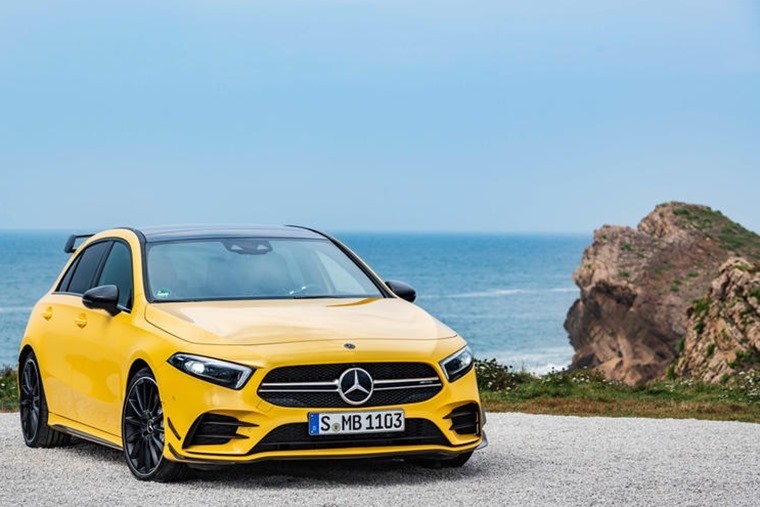 The standard A-Class already has a class-leading cabin, but the A35 adds supportive sports seats that are heated and electrically adjustable and an AMG-specific steering wheel. Fast and most definitely fun it might be, but this entry-level AMG misses out on the hooligan-like drive that has made other performance Mercedes appeal in the past. Exactly the same as any other A-Class. In a word, practical. 167g/km and 38.7mpg combined from 306hp is impressive, although economy will dwindle if you use all of it all the time.